Singlet Fission (SF) is a spin-allowed process that converts one singlet excited state into two triplet excited states. The ability to effectively implement SF processes in solar cells could allow for more efficient harvesting of high-energy photons from the solar spectrum and allow for the design of solar cells that circumvent the Shockley-Queisser performance limit (ca. 30% efficiency). In tailoring a chromophore for SF, two criteria must be met: (1) the energy of the lowest-lying singlet absorbing state must match or exceed the energy of two triplet excited states (S1 ≥ 2T1), and (2) the photoexcited chromophore in its singlet excited state must be able to share its energy with a neighboring ground state chromophore (i.e., electronic coupling of chromophores). Figure 1. 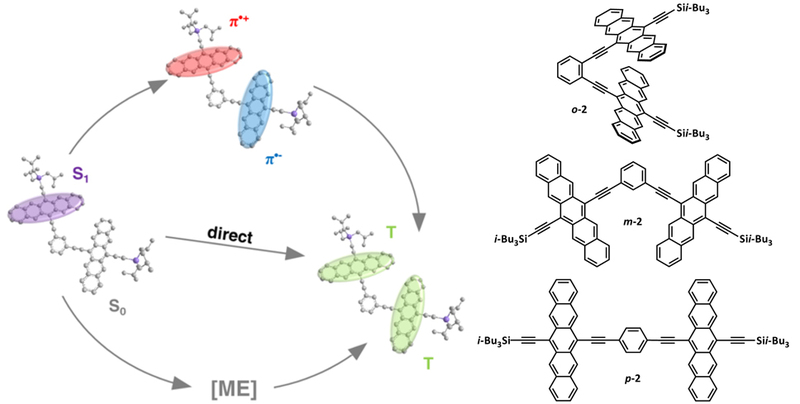 Conjugated pentacene dimers o-2, m-2 and p-2 and a mechanistic illustration of the molecular singlet fission. Oligoacenes, such as tetracene, pentacene, and hexacene hold great promise for SF. Pentacene has a triplet excited state significantly less than half the energy of its singlet excited state (S1 ≥ 2T1). 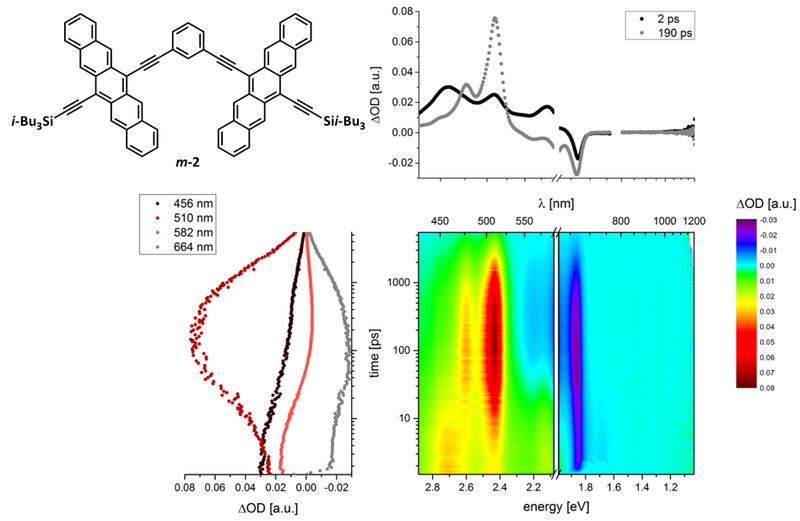 In order to achieve electronic coupling of two pentacene chromophores for SF, geometric constraints exist on the relative orientation of the two pentacene chromophores. Predicting and controlling solid-state morphology, such as in films for solar cell applications, remains a challenge, therefore molecular materials were designed by covalently linking two pentacenes to form dimers o-2, m-2, and p-2, thus facilitating electronic coupling between two pentacene chromophores via through-bond and/or though-space interactions towards achieving SF independent of morphology. Figure 2. (Top left) Chemical structure of m-2. (Top right) Differential absorption spectra (visible and near-infrared) of the spectra shown in the lower right with time delays of 2.0 ps (black) and 190.0 ps (grey). (Bottom left) Time absorption profiles of the spectra shown in the lower right at 456 nm (black), 510 nm (red), 582 nm (orange), and 664 nm (grey) illustrating the dynamics of the singlet excited state formation followed by the singlet to triplet transformation in the form of singlet fission, and triplet- triplet annihilation. (Bottom right) Differential absorption changes (visible and near-infrared) obtained upon femtosecond pump-probe experiments (610 nm) of m-2 (3.5 x 10—5 M) in argon saturated benzonitrile at room temperature with several time delays between 0 and 5500 ps. J. Zirzlmeier, D. Lehnherr, P. B. Coto, E. T. Chernick, R. Casillas, B. Basel, M. Thoss, R. R. Tykwinski, D. M. Guldi. © 2016 Dan Lehnherr. All Rights Reserved.